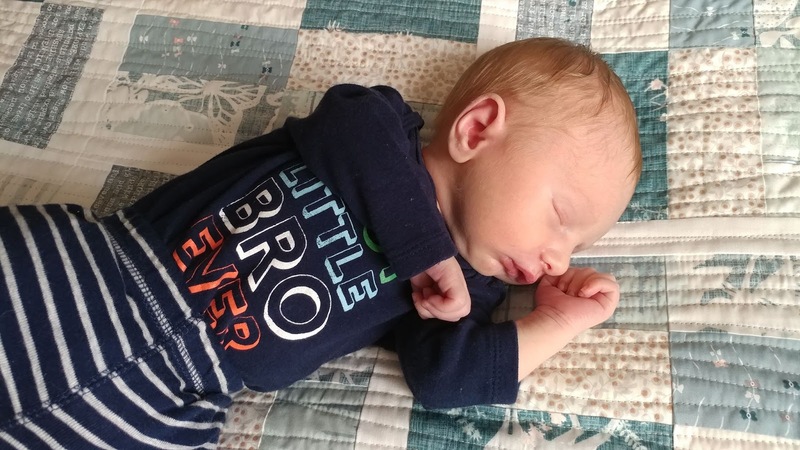 Slice of Pi Quilts: It's a boy! 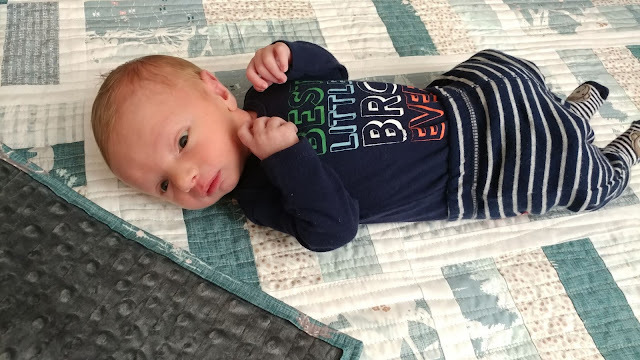 After I finished my last quilt, I decided that the baby needed a quilt all it's own. We do not find out the gender of our children before they're born, so I needed something a bit gender neutral. I'm a huge fan of aqua (no surprise there! ), and I think the aqua and gray are a really great gender neutral combo. 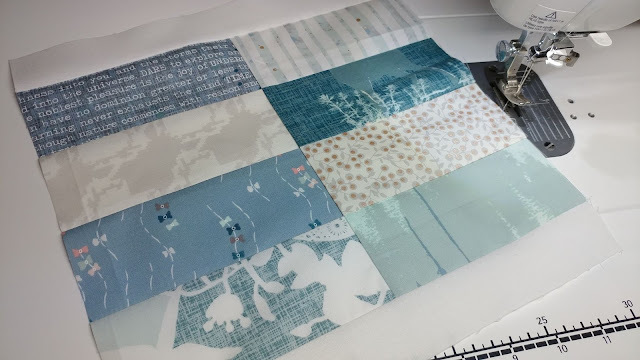 I decided to take two prints out of the mix for this quilt (the two on the far right), as they seemed a bit more girlish than the rest. 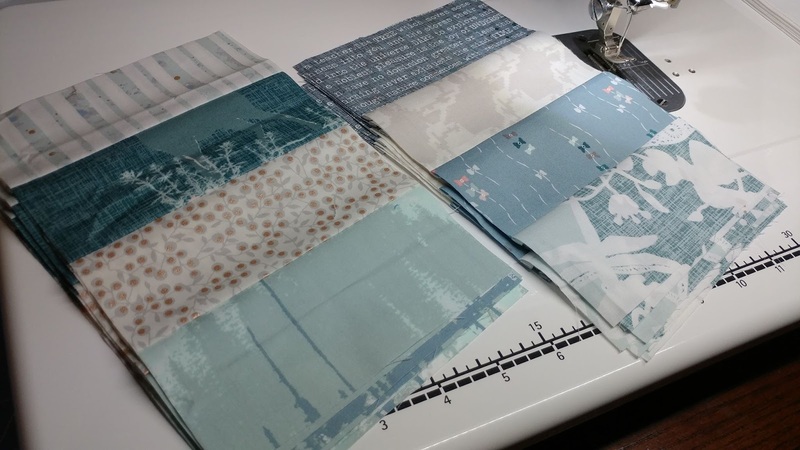 I cut a few 2 1/2" strips from each print and sewed four strips together. From each of these sets, I cut 5 1/2" wide units. 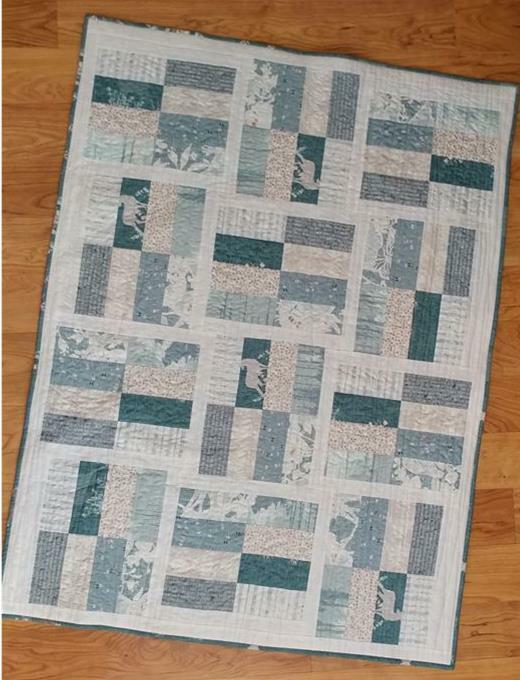 I sewed two units together and put a 1" strip of white fabric on two sides to create a 10" (finished) block. I had intended to make 16 blocks, but the strips were just shy of the needed amount to get that many units cut. So I just went with 12 blocks instead. That evening, I sewed the blocks together and finished the top by putting a 1" strip of the white fabric as a border on all four sides. When our first son was born, his birthday had a similar number pattern, but used the digits 0-4. We laughed and thought that was a neat coincidence. When our second son was born, his birthday landed on a number pattern date as well, but also had the digits 5 and 6. When my due date was nearing for baby #3, I realized that the baby would be born in September of 2018 - which would include digits 8 and 9. The only missing digit from our three children's birthdays was a 7. Now back to the quilt story. I finished the quilt top at 11:30pm on September 6th. As I got into bed, I told my husband that the 7th would be the day to have the baby to fit into our birth date pattern. We laughed and went to bed. Just after 1am, I was awoken from a dead sleep because my water broke! As my husband called family to come watch our older children, I just started laughing. The birth date would in fact include digits 7, 8, and 9! Our days since have been quite full. 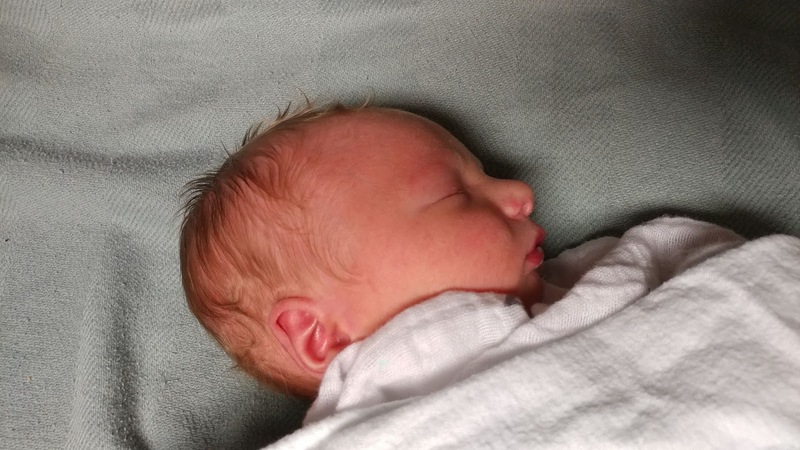 In addition to our regular schedule, we've added diaper changes, nursing, and baby snuggles to the list. Quilty finishes have been moved to a back burner as my most important finish for the year takes priority. I've snuck in a bit of sewing time here and there in order to finish the baby's quilt. 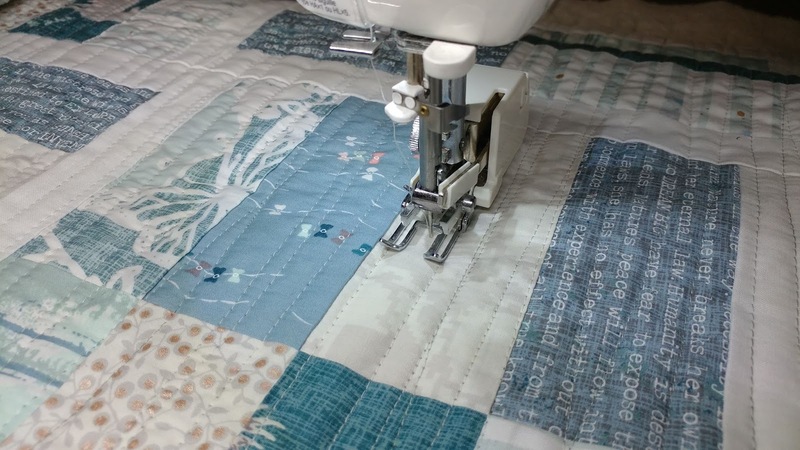 I pin basted the quilt with Hobbs Heirloom cotton batting and the gray minky for the back. I was sure to tape the minky to my dining room table quite taut and used just a few more pins than I usually would to try and ensure that it wouldn't pucker during quilting. 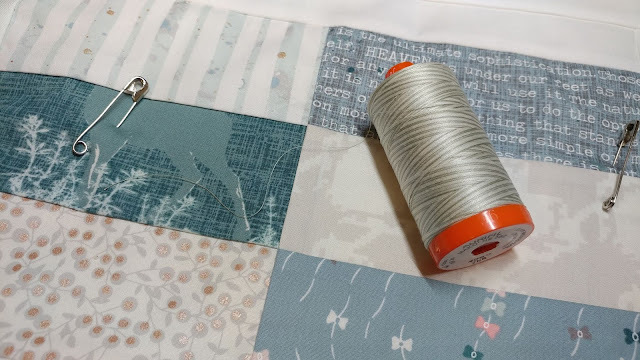 I chose variegated 50wt Aurifil thread #4060 for the top and Aurifil 50wt Grey #2605 to use in the bobbin. 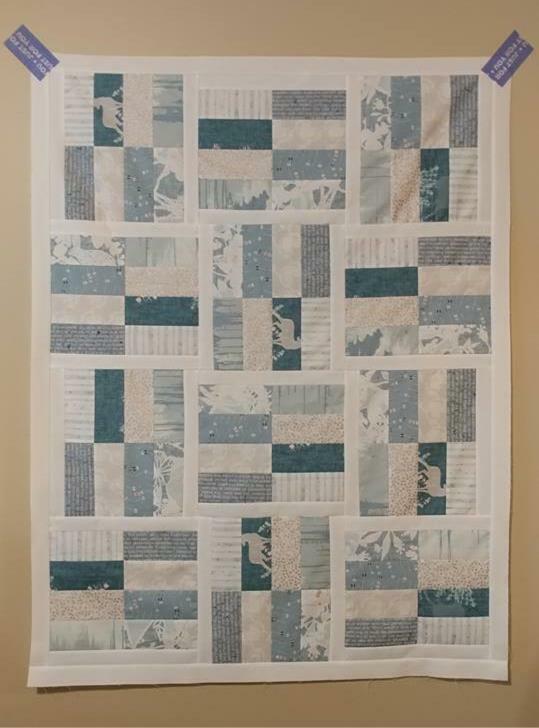 The variegated thread is a great mix of grays from light to medium that worked well with the top. I used my walking foot to quilt vertical lines on the top, averaging about 1/2" apart. 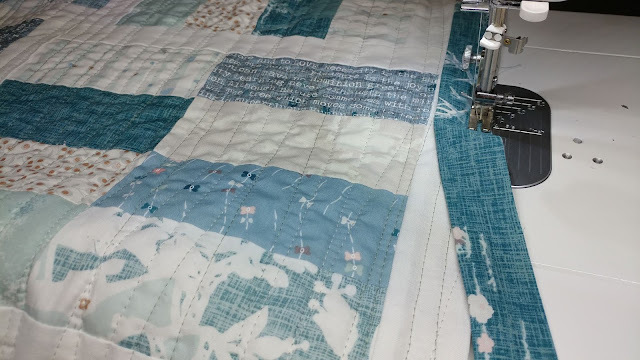 The lines are a bit squiggly (I used the same quilting on this quilt) and overlap occasionally. 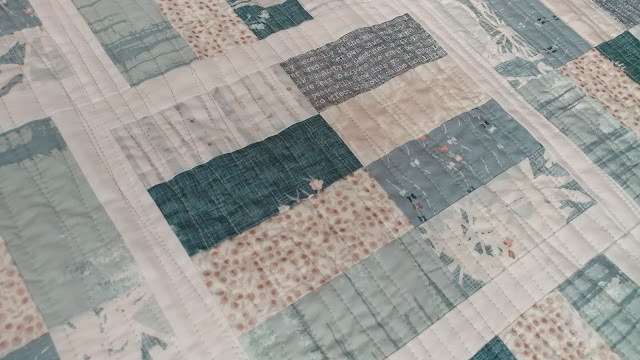 I finished the quilt by machine stitching on the binding - made from the darkest teal/aqua print in the collection. The quilt is a great size - about 32" x 42". 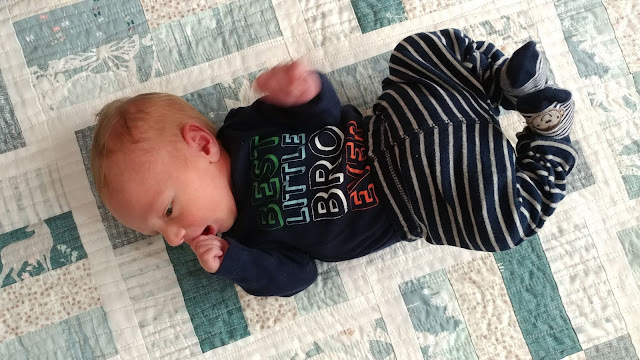 It will get lots of use for tummy time now, and I can already see it will be a favorite among the boys with the minky back! 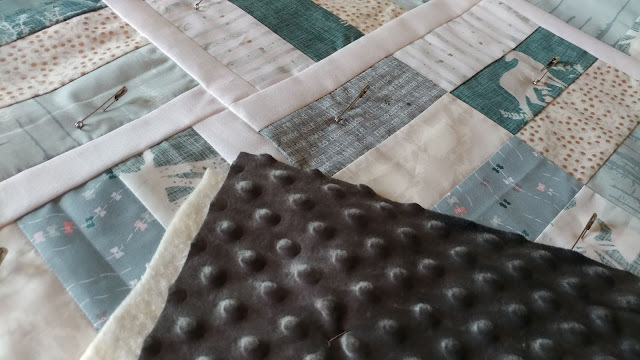 The quilting adds a great texture to the front of the quilt, but the minky keeps it's softness and dot texture on the back. Definitely a combo I would use again! To be honest, I expected to have issues with the minky. 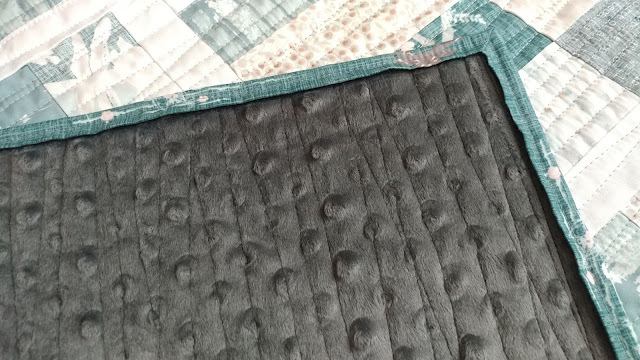 However, it quilted beautifully, and I didn't get a single pucker in it at all. This quilt is my 44th quilt finish for the year. 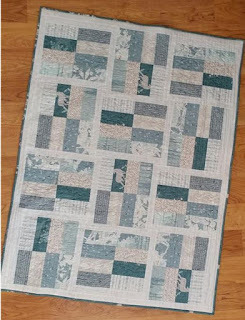 And the first quilt finish as a mom of three! 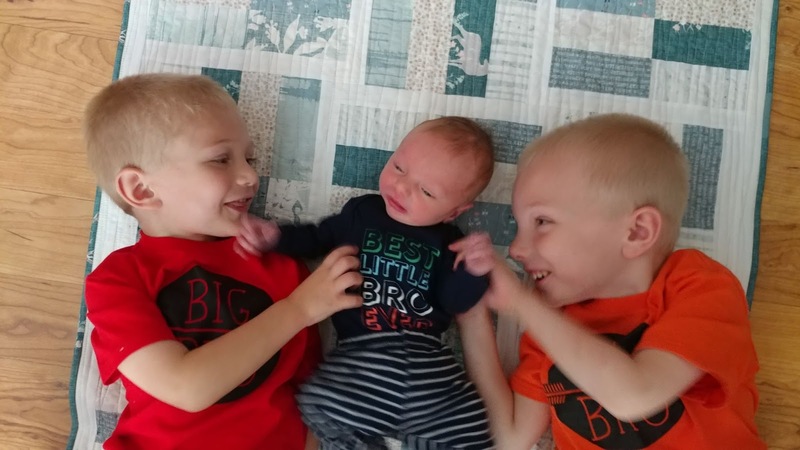 We now have three boys: Jeremiah, Micah, and Elijah. 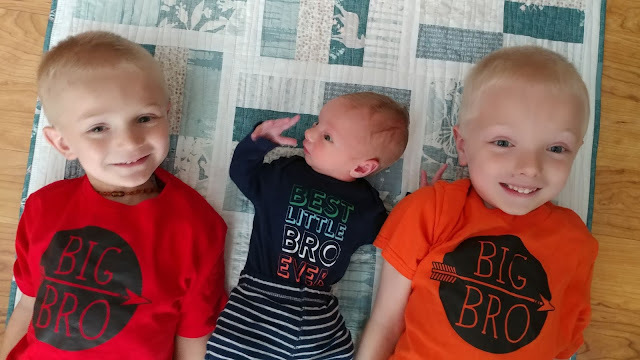 I'm definitely a boy mom - outnumbered and blessed. Love your quilt (minky is great as a quilt back), but your #3 is the best!! You have a lovely family of boys...are you going for a basketball team?? 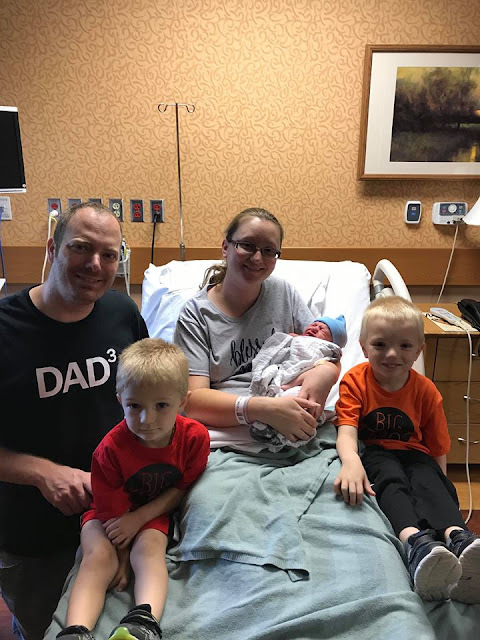 Congratulations on your new addition!! what a beautiful quilt, perfect for your precious new angel, Laura! He looks right at home with his adorable big brothers. Congratulations to all of you! Cute story about the way the numbers worked out. Glad he "got with the program" and came on the right day for you, ha! So happy for you! I love the number combinations for the birthdays; sometimes things just work out that way. 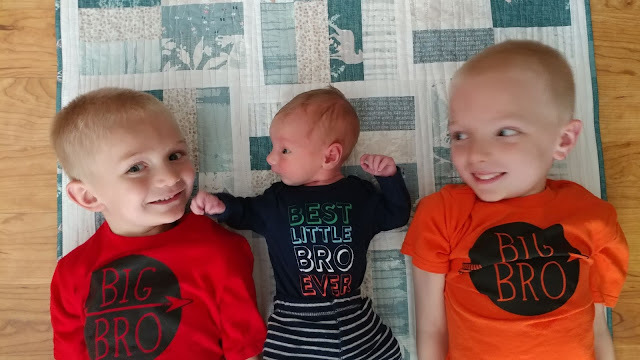 The big brothers look quite pleased with their brother. I had 3 brothers and a son, so I am used to being outnumbered by the mailes in my house! Enjoy this time, it goes fast. 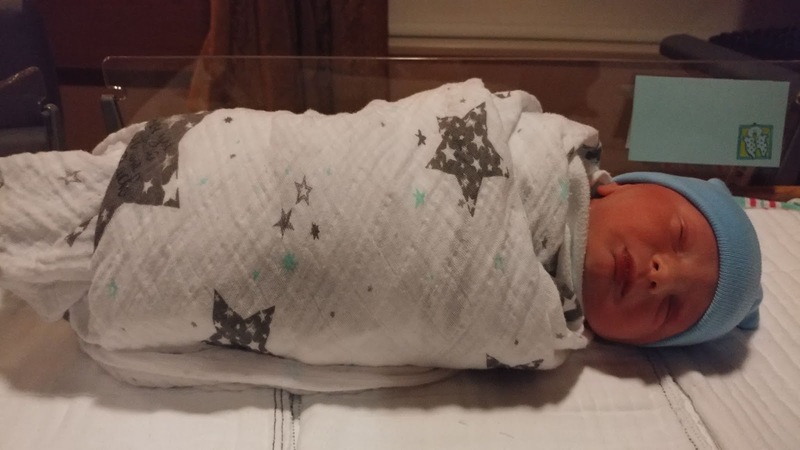 Congratulations on the new additions to the family, both the baby and the quilt! How nice that they all cooperated with your number patterns. Hope they cooperate in all other things in life. Your son is so precious, as are the other two, and that quilt is really wonderfully sweet. Ah! You are clearly outnumbered but there’s a lot of joy with boys. Congrats to you and the family—the quilt is adorable. Congratulations--beautiful family, and a beautiful quilt! 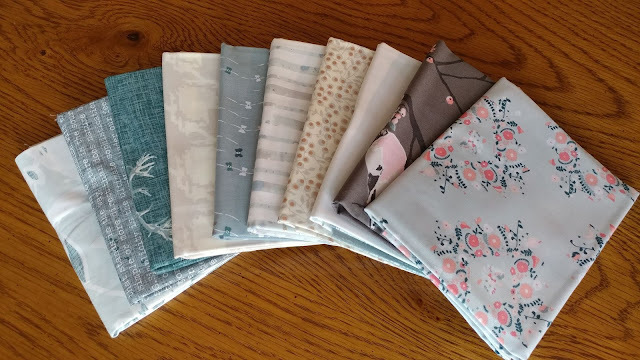 I have three boys and didn't get any sewing done when they were small, so I am amazed at all your finishes so far! Congratulations! Your quilt is awesome and your boys are beautiful. 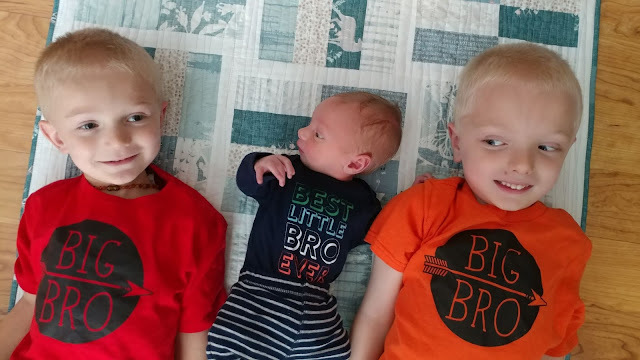 Great names for All three boys. I hope you are able to sneak in some rest time for you. Enjoy this time when they are little. They grow up so fast. Congratulations!!!!! 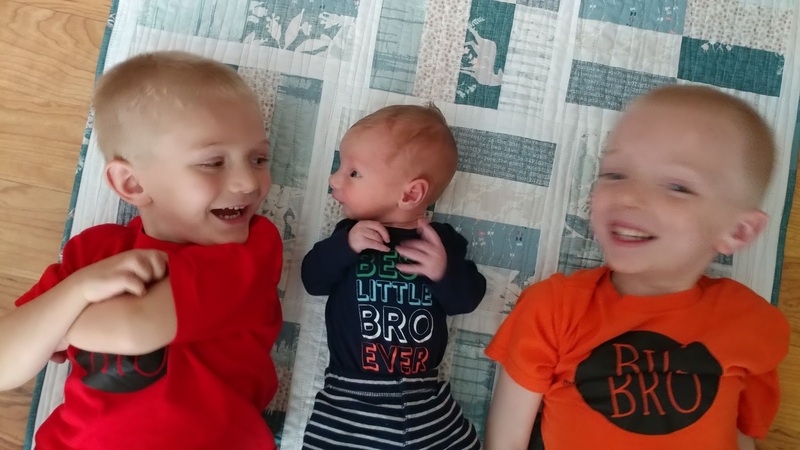 Such a beautiful baby boy, and your older boys look quite happy in the roles of big brothers. 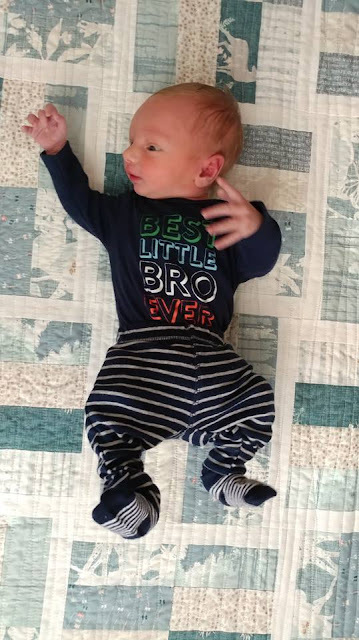 There is nothing better than pictures of babies on quilts!!! 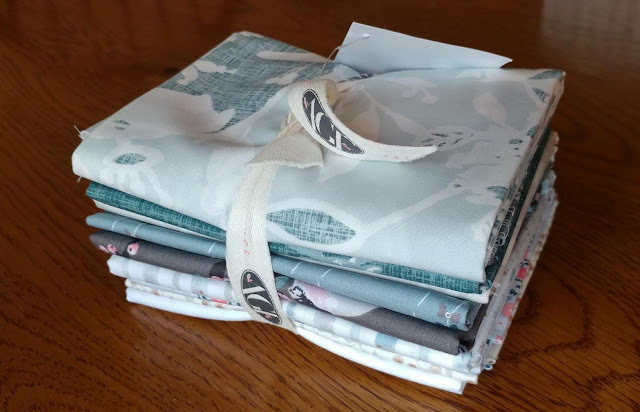 Thanks for so much quilty/baby goodness! Congratulations, Laura! What a beautiful family! Congratulations Laura!! 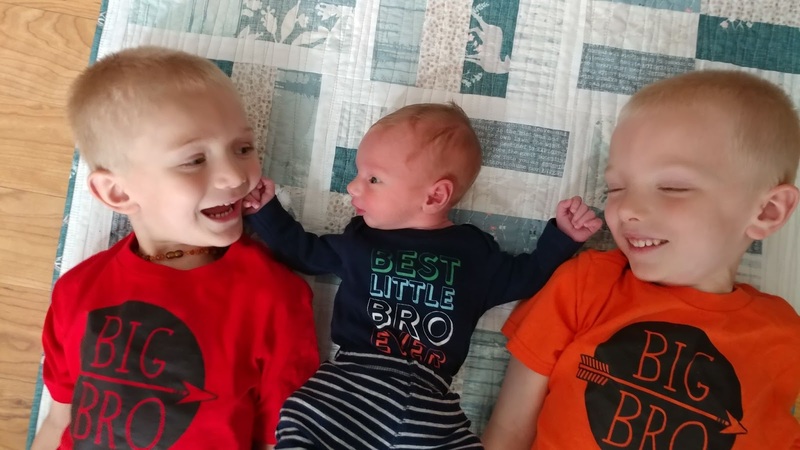 So much fun to have 3 boys! Your family is adorable! Congratulations! There's definitely a family resemblance among those boys. I love dad's t-shirt. 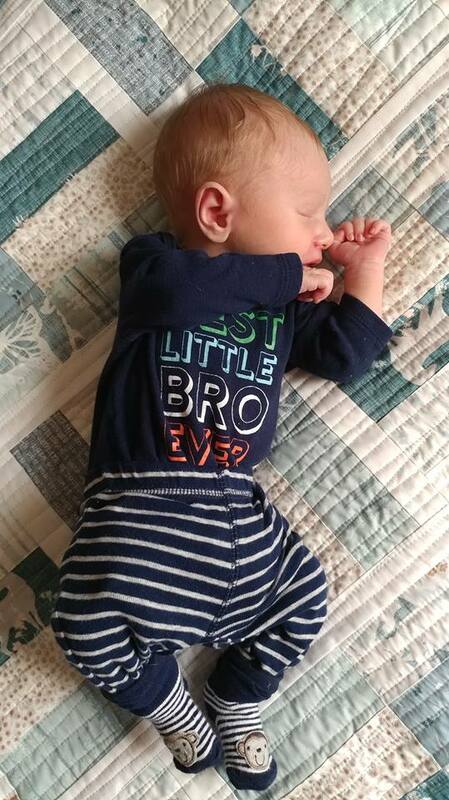 I can't believe that you finished a quilt so soon after he was born, and such a great one, too. You are amazing super-mom! Congratulations, Laura. You have such a lovely family and this little guy looks like he is being treasured by the big boys. He also looks like he is quite alert and interested in them! What a great creation for your and your husband. And the quilt is lovely. The colors are wonderful and the minkey choice is great. I look forward to more updates on this little guy. Congratulations! What a beautiful little boy. I love the pictures of your three boys on the quilt. Enjoy your time. Congratulations. My hubby likes all the number plays too. Great shirt the father is wearing. Nice quilt for all three boys too. Oh, congratulations - how special! What a fantastic finish! Btw, I love how nerdy you are with the numbers. It was meant to be! Congrats. You have a beautiful family of boys! Boymoms are awesome (I have two of them)! Congrats! Your boys are beautiful. The hospital picture shows them to be a beautiful resemblance of both you and your hubby. Congratulations! 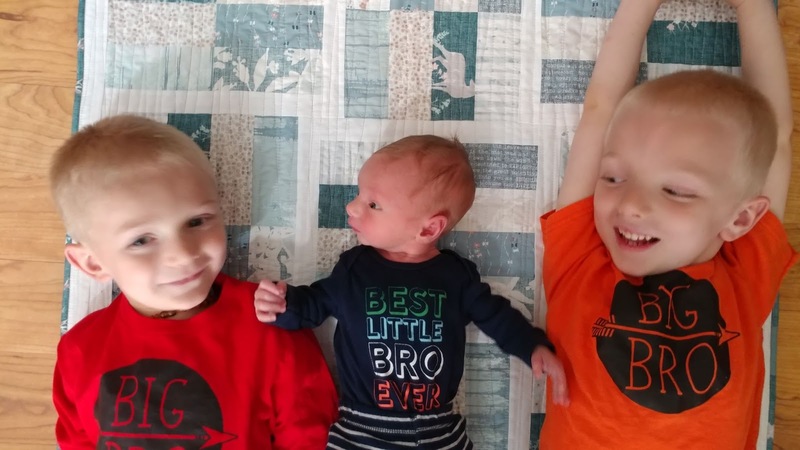 I like the photo where it looks like "Little Bro" is reaching out for both "Big Bros". You and your Hubby are truly blessed! Love your quilt, too. What fun!!! Blessings to you and your lovely family!!! Enjoy these days as they go way too fast!!! Congratulations! What a beautiful family. A lovely quilt also! Blessings to you all!